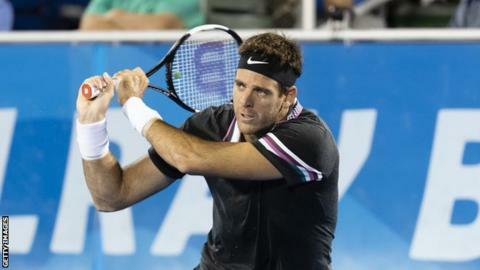 Top seed Juan Martin del Potro eased through to the quarter-finals of the Delray Beach Open with a 6-4 6-4 win against American Reilly Opelka. The Argentine, playing his first tournament since breaking his kneecap at October's Shanghai Masters, held serve to love in the final game to wrap up victory in one hour 13 minutes. The 30-year-old will face American Mackenzie McDonald in the last eight. Fourth seed Steve Johnson of the USA beat Italian Paolo Lorenzi 7-5 7-5. He will meet Radu Albot in Friday's quarter-finals after the Moldovan beat Australia's Nick Kyrgios 6-2 3-6 6-3. Elsewhere, Britain's Dan Evans takes on sixth seed Andreas Seppi of Italy, while American second seed John Isner faced France's Adrian Mannarino.